While the action hero of the 1980s was often a police officer, military man and the like, a popular theme of the 1970s film was that of a regular man thrust into an extraordinary and dangerous situation. The 1976 John Schlesinger film, Marathon Man is one such example. In it, Dustin Hoffman plays a man named Thomas (often referred to by his nickname, Babe) who is a graduate student attending Columbia University and also training to run a marathon. Unfortunately, he becomes the target of a vicious, exiled Nazi named Szell (Laurence Olivier) because Szell assumes that he knows the whereabouts of some stolen jewels. Szell comes to this conclusion because Babe's brother Doc (Roy Scheider) is a member of a mysterious U.S. government group known as "the Division" and he was the last person in possession of the diamonds. Once Doc, who refuses to give any information about them is murdered by Szell, Szell goes after Babe in a desperate attempt to recover the treasure. This film includes a scene that utilises dentistry as torture-- and that to great effect. 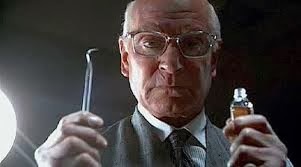 Szell is both a Nazi and a dentist (a horrible combination) and uses his drill and a dental pick to rip through Babe's sensitive teeth and gums. "Is it safe?" he calmly asks over and over again to a bewildered and terrified Babe. The compelling aspect of this film is the way in which Babe evolves. Babe is a man who has his reality upended in that he realizes that he knows nothing about the real lives of the people he cares about and, as a result, is forced to deal with grave danger. Hoffman was the perfect choice for this role because of his everyman quality. He is rather average and unremarkable. He's short, not particularly strong or muscular, his voice has a meek and droning quality. It is exciting to watch him escape Szell and his awful dental tools and his marathon training comes to good use when he is pursued by Janeway (William Devane), a corrupt Division agent. 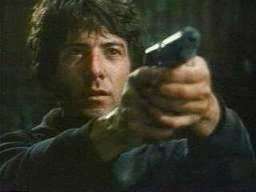 For the record, I don't like Dustin Hoffman at all. He's one of those regular guy actors that everyone loves (Jimmy Stewart is an example from another era) that really annoys me. I can't even really explain it, I'm just repelled by him. I think maybe it's the self-awareness he has vis-a-vis his regular guy status. Also, a movie star should have something remarkable about them. I don't mean great physical beauty or anything-- just something compelling. I don't see anything really compelling in Dustin Hoffman. Which is why I think this movie is so great. Despite my lukewarm feelings for Dustin Hoffman, I can watch this movie over and over again. It's just that good. I don't mind that he's in it because the point is that it's the story of an average guy in an above average situation. In fact, it is his averageness that makes the movie work. Hoffman's presence in Marathon Man makes clear that this is a film concerned with the survival instinct. Babe is an intellectual, a man seemingly uncomfortable with asserting himself or dealing with confrontation who is forced to fight for his life. In many ways, this sort of action film is much more challenging than later films as it maintains a realistic tone all while showing scenes of incredible violence and danger. More to the point, the protagonist is shown to be greatly affected by these incidents. The action hero of the 80s is unfazed by all that occurs around him. He dodges bullets and explosions without expression or makes a joke of them. Babe is clearly shaken by the events he has experienced and it is his emotional transformation that makes this film.